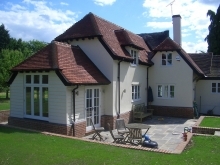 Extensions and alterations to a Grade II listed thatched property. Foxglove Cottage is grade II listed and had an existing thatched two storey extension at the rear with a kitchen on the ground floor and a master bedroom and en-suite above. However, the first floor accommodation was completely isolated from the rest of the house which was impractical for family life. 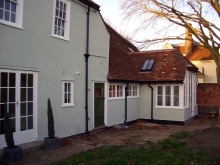 The replacement two storey extension adds a vital link at first floor level that enables access to the first floor areas of the original cottage by way of a careful insertion of an oak staircase up and over the existing eaves plate. The extension provides a better proportioned kitchen on the ground floor that is open to a separate dining area and whilst the master bedroom and en-suite are still positioned above the kitchen, it is now accessed via a self contained landing which also gives access to an additional small bedroom. Circulation within the house has been completely transformed with the addition of the first floor link but also by changing the back and front of the property. 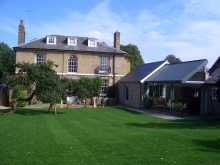 The driveway has been moved away from a blind bend to a country track so that the building is approached from the opposite direction and a new front door created as part of the extension.